These books provide clinically relevant questions of the process of taking a history and performing a physical examination, with sections on Useful Background, and where available, evidence-based performance characteristics of the rendering of our clinical skills. Volume 1 covers Cardiology, Endocrinology, Hepatology, and Nephrology. 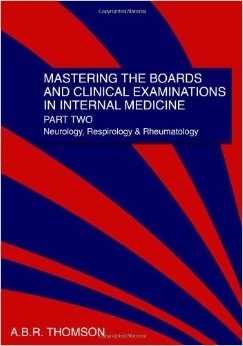 Continuing with the premise of volume 1, volume 2 covers Neurology, Respirology, and Rheumatology. Disclaimer: Neither the author(s) nor CAPStone Academic Publishers can ensure the accuracy of the information contained in these books with regards to regional variations for recommended indications, dosages, and reportable adverse events. With the rapid expansion of medical knowledge, there may be, from time to time, variations between what is published in these books and the latest information and consensus recommendations made by different organizations. It is the responsibility of the reader to confirm independently any practice decisions related to an individual patient. © All website and downloadable materials copyrighted by Alan B. R. Thomson, 2012-2017.